What Bumpers Work Best With Lights? Most people spend their time driving down well lit highways and city streets, but for country folk, this isn’t always the case. Many roads across the country don’t have the best lighting, which unfortunately, can make things a little bit more dangerous for drivers. 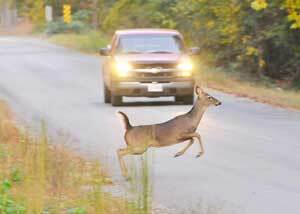 For example, there are over 400,000 vehicle collisions with deer each year! There are a number of eye popping statistics that showcase just how dangerous these unlit roads can be. The best way for drivers to protect themselves from these dangerous elements is with a truck bumper that features extra lighting. This extra lighting can help enhance vision and ultimately prevent an accident from occurring. This entry was posted in Bumper, Trucks & SUVs and tagged extra lighting, Truck Bumper, truck bumper lights. Bookmark the permalink.